Come on out to Tutti Frutti (Main and Teel next to Starbucks) and help support The Legacy Line Dance and Drill Team! 15% of gross proceeds for the day will be donated to Legacy Line! Support local businesses that support the Wakeland Legacy Line! Save the Dates: More details coming soon! The Legacy Line Spring Show! Monday, April 15 and Tuesday, April 16th! Come along for the ride and prepare to be entertained for a showcase of performances from the 2012-13 Legacy Line. These students will be performing in the 27th Annual London New Year's Day Parade. From Left to Right: Kendall C., Rachel C., Mckenzie W., Madeline D., Jolie G., Brittany W.
The Legacy Line is planning for their Spirit Poster with photographer Don Sparks! Our Road Trip took us to the Forest Park Medical Center Fountain in a 1971 Oldsmobile Cutlass Supreme! 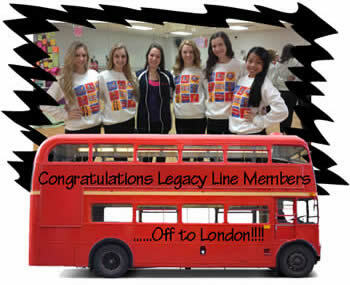 The team was in top performance and ready to go for a great year on Legacy Line! The last team shot of the night captured Ms. Grider joining the ride and Mr. Sparks found himself in the middle of the fun! Thanks everyone for a great photo shoot! Hope to see lots of fans at the Pep Rally on Friday at 3:30pm in the gym and at the Wakeland football game against Frisco High School at FC Dallas Stadium at 7pm. Go Legacies!!! 2012 A Legacy in Leadership! WHS student Madeline Doerr was chosen in May to attend the Southwest Youth Leadership conference over the summer at Texas Wesleyan. Her original nomination came from staff here at Wakeland as a potential student to attend. While at the conference she was picked as the “Outstanding Leader” at the conference. She will be recognized on Tuesday, September 18 at a Luncheon hosted by the Military Order of the World Wars, who chose and paid for her to attend the conference. Congrats Madeline! Purchase Mary Kay products from August 28th-September 11th, 2012 and 50% of the profits will be donated to Legacy Linebackers booster club! All orders must be placed through Amber Gregory via phone, email or by visiting her website. All orders need to note LEGACY in the comment section of the order. Thank you freshman mom's for making these awesome locker decorations. You made the first day of school fantastic for the girls!